1. The amount of exports of Company X (in Pesetas) in the years 1993, 1994, 1995, 1996, 1997, 1998 and 1999 are 30, 60, 40, 70, 100, 50 and 120 respectively. 2. The amount of exports of Company Y (in Pesetas.) in the years 1993, 1994, 1995, 1996, 1997, 1998 and 1999 are 80, 40, 60, 60, 80, 100 and 140 respectively. 3. The amount of exports of Company Z (in Pesetas) in the years 1993, 1994, 1995, 1996, 1997, 1998 and 1999 are 60, 90,, 120, 90, 60, 80 and 100 respectively. = 1/7 x (80 + 40 + 60 + 60 + 80 + 100 + 140) = 560/7= 80. = 1/7 x (60 + 90 + 120 + 90 + 60 + 80 + 100) = (600/7 ) . 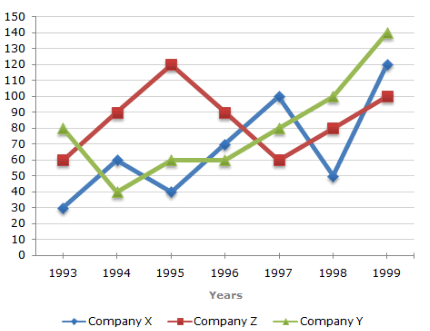 From the analysis of graph the exports of Company Z are more than the average annual exports of Company Z (i.e., 85.71) during the years 1994, 1995, 1996 and 1999, i.e., during 4 of the given years.